JurongHealth Mobility Park is Singapore’s first rehabilitative space with life-size replicas of public transportation and stimulated streetscape. Within the integrated healthcare club comprising of Ng Teng Fong General Hospital (NTFGH) and Jurong Community Hospital (JCH), is Singapore’s newly opened outdoor rehabilitative space –JurongHealth Mobility Park. Unlike other typical rehabilitative parks, this park boasts unique features such as simulated home and community environments for physical rehabilitation. Featuring pedestrian crossings, walkways with different surfaces, ramps, steps and road-side curbs, etc., the presence of such actually acts as a simulation of real life street environments. “The JurongHealth Mobility Park is another important piece that will transform the way rehabilitation is conducted in a healthcare setting,” said Mr Foo Hee Jug, CEO, JurongHealth. Unique to the park, it is also the first of its kind in Singapore to feature life-size public transportation models in the form of a decommissioned taxi, a low-floor bus mockup and an MRT train mockup. All of which, sponsored by multi-modal public transport operator SMRT Corporation Ltd. These mock-up vehicle models will help patients to adapt better and faster when they are discharged from the hospital, back into the community. Thus, it gives them more confidence to better ease back into their daily routine. “Caregivers play very important roles in the rehabilitation and recovery process of our patients and we want to also provide the caregivers with a lifelike environment where they can learn to confidently assist their dependents in maneuvering barriers and moving around,” said Mr Foo. In addition, to fortify patient’s rehabilitative process, the outdoor park also includes a sensory garden with herbs and plants. This is designed to allow patients especially those on wheelchairs, to come up close with nature which will aid in heightening their sense of touch, feel and smell and consequently enhance their rehabilitation process. “We are proud of the partnership we have had with JurongHealth over the past three years. SMRT is always looking for ways to support and give back to the community that we serve every day,” said SMRT President and Group Chief Executive Officer. As part of this project, both JurongHealth and SMRT have also organised learning and sharing sessions amongst the staff from both organisation. 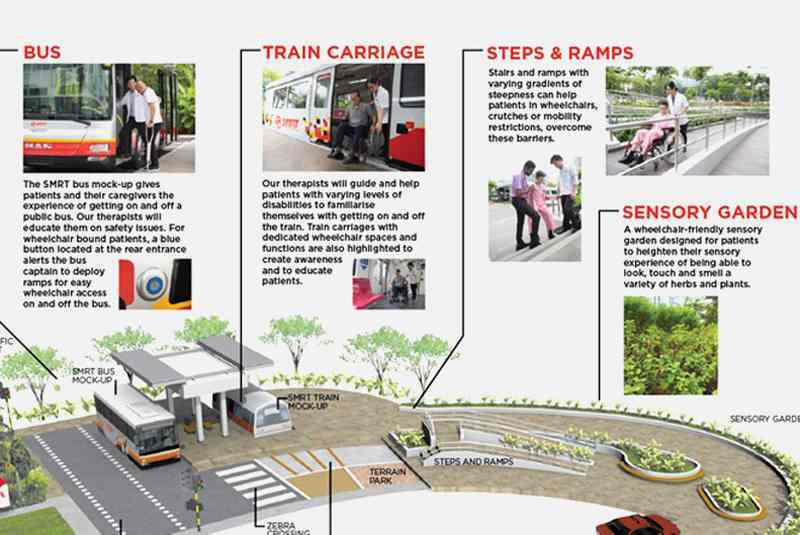 This is so that they can provide more sophisticated assistance to help patients and commuters, to make the essential adjustments with the aim of boosting their confidence when using public transportation.